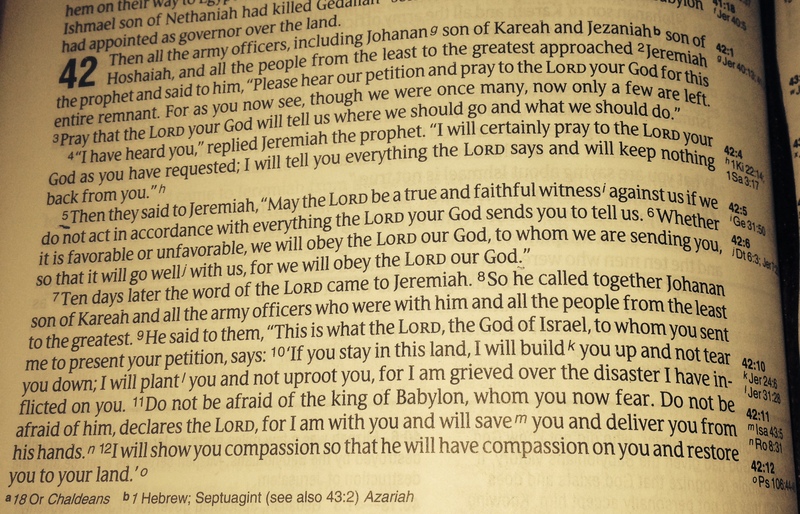 I have been thinking about this for awhile and as I read parts of the Book of Jeremiah this morning, I was inspired to share. By now, everyone has probably heard and seen the video of Janay Palmer-Rice and former Baltimore Ravens Ray Rice. I, apparently, was one of the few who had never heard of Ray Rice prior to his knockout blow. It would not have altered my reaction if I had. In the days and weeks that followed, I listened to views “for and against” her side, his side, the NFL’s side, the team’s side, the hotel’s side, the legal side…. There are so many sides! I listened to the couple’s words, Mrs. Rice’s in particular, and took away a profound lesson. You know, as Christians I commonly hear us say, “Lord, use me.” When I was younger, I did not fully understand what this request could mean. Even now, while in the midst of being used by God it is easy to forget that we asked to be used. There was a time when I thought that there would be no difficult days, no struggle, no storms while I was being used. “How could there be,” I would think. The Lord is with me. Then one day, you receive a Word that you do not like or find yourself in a situation where you feel as if the intentions of those around you are (as described by Mrs. Rice) “to hurt [you], embarrass [you], make [you] feel alone, [and] take all [your] happiness away” and you are tempted to tell God “never mind”. Let’s be honest, most people want to live an easy life—professed Christians included. Everybody will not understand “living in exile for 70 years and then you will become prosperous”, but will recite to you Jeremiah 29:11. I am at the point in life where I know I do not understand all of God’s ways. I believe though that if I am doing what He has directed me to do, then I will be protected and blessed no matter how it may look to you. The Rice’s public domestic violence situation has led to a significant increase in calls to the National Domestic Violence Hotline. What if at some point Janay Palmer Rice asked the Lord to use her and He took her situation and did so in this way? What if this exposure was seen by someone 2000 miles away who could relate to her? What if that person was sitting in front of a laptop debating suicide, but called the National Domestic Violence Hotline instead? What if such person had only learned of the Hotline because it was trending on social media? What if that person is safe tonight?